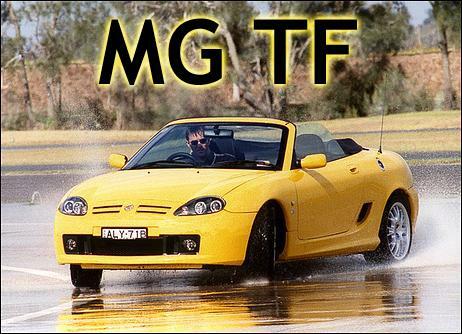 The MGF has become the MG-TF - and it's a better car. Glenn Torrens authoritatively reefed-on some steering lock, pitching the MG into the corner with decision and dexterity. The nose responded willingly, the mid-engine car feeling responsive and willing. From the passenger seat I watched the landscape pivot past, the TF now aimed squarely at the apex. The wind roared and buffeted the open cabin, a trace of tyre squeal accompanied the cornering. But then - in a heart-stopping instant - the murmur of the rear tyres was replaced with a harsh, shrill screaming, the scenery started to slide past wildly - and I grabbed the windscreen header rail as we were wrenched into a violent spin. The MG bounced over the low kerb and slid onto the grass - the cabin suddenly filled with thousands of dry grass clippings - and, hearts pounding, we slowly slid to a halt. Glenn turned to me and grinned, "See, it will do that if you go in too hard." We were guests of MG Rover Australia at the Norwell, Queensland driver training complex, now owned by Holden. After a morning of driving the newly-released MG TF on the demanding roads of the Gold Coast hinterland, we'd spent the last hour on the streaming-wet skidpan before being set loose on the circuit. And it was here that Glenn had spun the MG TF, not once, but twice. Just seeing if it would respond in the same way again.... And it did. Don't get us wrong. The TF - much more than just a facelift with all-new suspension - is extraordinarily competent and forgiving in its handling. But like all cars, it does have limits - and step over them and the back of the car can come round. 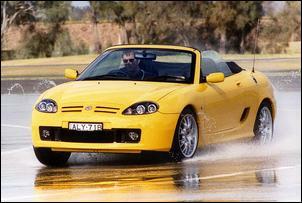 The previous MGF had relied on dialled-in understeer to warn the driver that the limits were being reached - while we never experienced it, apparently going to extremes could result in a vicious, no warning spin. Hence the excessive understeer. But with the Hydragas suspension now dropped from the TF, MG engineers were able to design a more effective multi-link rear suspension - and provide much more progressive breakaway characteristics. It works too - the normal neutrality of the car's handling is best seen in the tyre wear patterns, where both the front and rear tyres were showing similar degrees of unhappiness after some hard circuit punting. In normal on-road driving - even when going very hard - the TF has mild turn-in understeer and equally mild throttle-off oversteer. In a way it's more like a well set-up front-wheel drive car than a mid-engine rear wheel drive. But while the throttle control of the K-series engines (three different states of tune are available) is masterful with wonderfully developed torque right across the rev range, the electric power assisted steering remains a weak link in the on-road dynamics. With software and hardware changes it's better than the previous model ("...it has several odd characteristics, including altering in weight depending on the degree of lock being used, and a lack of assistance at centre which suddenly turns into - relatively - lots of help as you start to apply input" we said about the Trophy 160's steering), but a trace of non-linearity in response and feel still exists around centre. 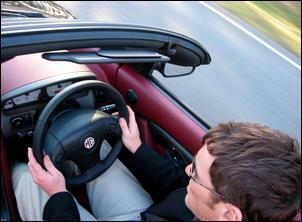 It's nothing as good, for example, as the still brilliant MX5/Miata power system. 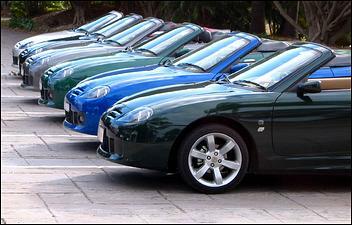 And of course the MX5/Miata is the car that the revised MG TF has most firmly in its sights. Whatever the spread of cars that MG Rover Australia discuss as competitors for the TF, it's the Mazda against which all others in this category are evaluated. In Australia in the first seven months of this year the MX5 sold 476 cars; over that same period 113 MGFs found their way out of the showroom. So are the TF's sheetmetal and engineering changes enough to change that around? Most agree that it's a very successful styling update: the MG has lost its placid - but pleasant - features and gained a major dose of testosterone. While the original bonnet is retained, the new front bumper/spoiler is new, as are those Supra lookalike polycarbonate headlights. Housing twin 70mm projector beams, they thrust the nose forward aggressively. New single-piece side panels are also now used - together with the fitment of many tubular braces and the filling of the A-pillars and windscreen header rail with an expanding material, these changes improve the torsional stiffness of the body shell by a claimed 20 per cent. And while the car now does feel much stiffer on the road, there were noticeable variations in scuttle shake from car to car across the three cars that we drove. At the rear, the bootlid has a raised upper surface with integral spoiler with a LED brake light. In addition there are other minor cosmetic changes - an alteration of the shape of the side air intakes, the use of twin round exhaust pipes and stuff like that - but the overall effect is to bring the TF visually right up to date without losing the purity of shape of the original. The body changes also have a claimed aerodynamic benefit: the drag coefficient has been reduced by 5 per cent to 0.36 and lift is down by 28 per cent. While MG doesn't state it, these figures almost certainly apply only with the roof up. But it's in the suspension where the most surprising changes have been made. Gone is the famous - and venerable - Hydragas suspension, and in its place are conventional steel springs and gas dampers. (And why the change? 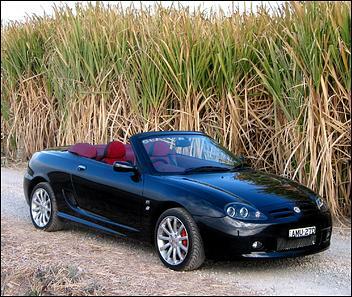 MG suggests that the MGF featured Hydragas only because it was built on the same assembly line as the Metro - so the suspension design of one car had to reflect the other. But now the Hydragas Metro is gone...) One of the features of Hydragas is a relatively compact suspension design, so without completely altering the TF's body architecture, the new suspension had to be equally as compact. A completely new multi-link suspension has been installed at the rear (although peer under the bum and you can see how some of the original brackets have been retained - with just new bits welded on....) with a major design aim of the rear suspension being improved camber control. An 18mm sway bar is fitted and rear rolling stock comprises 215/40 ZR16's. At the front the suspension remains similar to the F's, but with the double wishbones using conventional springs and dampers and employing a 20mm sway bar. Significantly, the previous toe-out has been replaced with a zero toe setting - certainly something that would help in the reduced understeer. 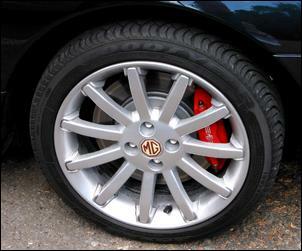 Front tyres are narrower and higher profile 195/45, also worn on 16-inch alloys. 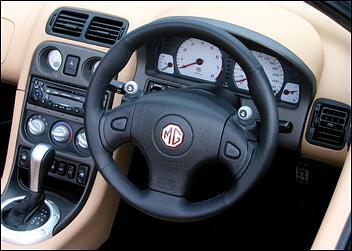 One of the aims of the new car was to give a ride comfort markedly improved over the special edition MGF Trophy 160 - while having handling at least as good. And the TF does ride very well: the country road drive circuit took us over some very bumpy and demanding roads and the car showed an excellent compromise of ride comfort and grip. It was extraordinarily difficult to bounce the car the car offline, and when all the suspension travel was - eventually - used up, the bump-stop impacts were mild and progressive. Especially considering its light weight - just 1150-1180kg, depending on the model - the ride is quite exceptional for a sports car. And so what are the models available? Entry is the TF 135, with a neat 100kW from its 1.8-litre K-series engine. Available only in 5-speed manual form, the car is willing and quick point-to-point - but it won't win too many traffic grands prix. Stickered at $46,500 including air con, it's within $200 of the Mazda MX5 when similar specified. Next higher on the pricelist - but a long way south in our estimation - is the TF 120. With only 88kW and a CVT-style auto trans, we found the marriage of the lower-power engine and the automatic transmission (with finger-tip controls on the steering wheel) is not a happy one. What little throttle response the engine has is smothered by the trans, and even when using the somewhat cartoonish fingertip buttons, the trans only slowly moans from one gear to the next. It's a feature for marketers, not enthusiasts. Pick of the bunch is naturally also the most expensive - the TF 160 gets 118kW from its variable valve timed 1.8, comes with massive MG/AP 304mm front discs and four-pot calipers, and has uprated suspension. With a claimed 0-100 in 7.8 (again not a local figure so sure to be optimistic) and with a ride that remains excellent despite the altered suspension, at $51,000 it's only 10 per cent more expensive than the base model. On the whole the TF update is successful - though we wish they'd done something about the cramped footwells and so-so ventilation. The 100 and 118kW engines are sweet, tractable and progressive, while the ride and handling are now markedly improved. But the steering's just not on the pace, and that contributes to a tactile immediacy that - when compared with the MX5 - isn't quite there. 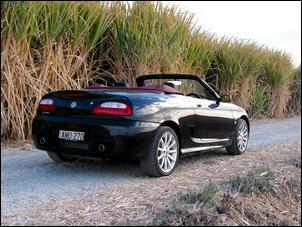 Glenn Torrens flew to Queensland courtesy of MG Rover Australia.